Halibut with Scallions and Squash | Om nom nom! 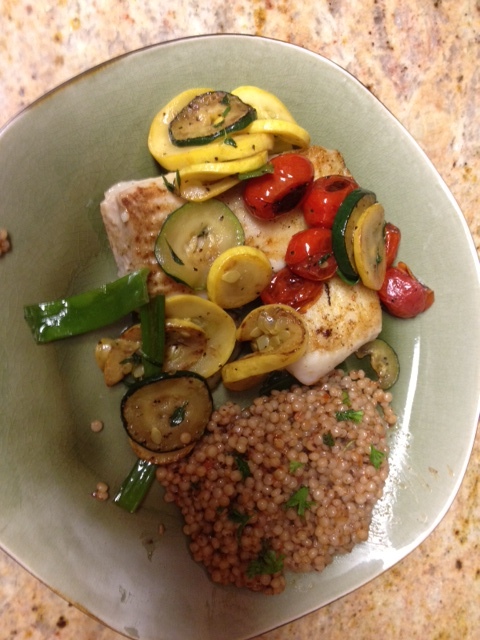 Great spring and summer dish for any white fish filets; halibut just happens to be my favorite. I got this recipe from Bon Appetit and was really happy with it. I also added some sauteed grape tomatoes to the mix for color and just a little different flavor, and served it with a side of lemon-olive cous cous. Heat 1 Tbsp. oil in same skillet. Add squash; cook, stirring occasionally, until golden brown and just tender, about 5 minutes. Stir in scallions, and 1 Tbsp. thyme leaves; season with salt and pepper and cook until onion tops wilt, about 1 minute longer. Remove from heat; set squash mixture aside. Heat remaining 2 Tbsp. oil in a large nonstick or cast-iron skillet over medium-high heat. Season halibut with salt. Add fish and thyme sprigs to skillet and cook until fish is golden brown, about 5 minutes. Turn fish and cook until just cooked through and opaque in the center, about 2 minutes longer. Divide onion-squash sauté among plates and top the halibut.